Is it another bank holiday? I’m starting to lose track. But that would at least explain why I’m in a pub on a Monday afternoon 150 miles from home. Regular readers – or indeed irregular readers who happened upon the previous A Week in Pubs – might remember leaving me in Cambridge last weekend after a wedding in a scandalously overpriced hotel. Here, then, like the second half of a Doctor Who two-parter, you rejoin me shortly later on the same trip, a few miles south in St Albans. I’m still reeling from paying £4 in the scandalously overpriced hotel. So a Wetherspoons is probably just the place to recover. 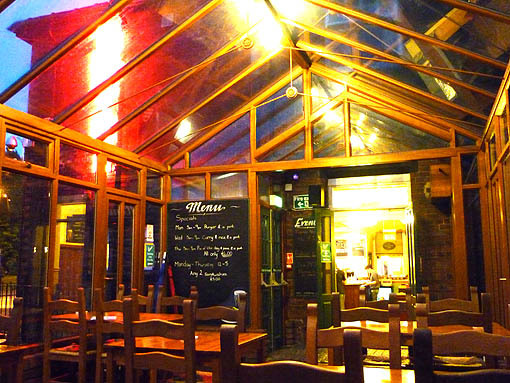 As Wetherspoonses go, the Waterend Barn (featured here) is one of the better ones. It’s also my in-laws’ choice of venue to take us out for lunch. They’re making the effort to take us to a Wetherspoons for lunch, because they know I like pubs, and I appreciate their kindness in this. As my friend Jeremy puts it a few hours later, however, when I’m back in Sheffield, Wetherspoons is “the pub for people who don’t like pubs”. I’m drinking with him at the excellent Hillsborough Hotel (pictured above) – very much a pub for people who do like pubs. This is why it’s nice just to sit on my own for a bit when I turn up very early at the start of the evening. With a pint of something cheerful from the Crown Brewery, based in this very pub. Listening to the teachers letting off steam on the next table. Reading my book about a junior lighthouse keeper in 1973 and the pub’s copy of the Non-League Paper. Moving to the conservatory to watch the the Don valley bathe in the sinking citrus sun. In another two-parter, Dan and I return to the Red Deer after band practice on Wednesday night. When we did the same thing last week we were stunned to find this hitherto quiet boozer packed to the beams with Young People. Some of them were playing cover versions on acoustic guitars. Tonight it’s packed to the beams with Slightly Older People and some of them are playing traditional celtic music on acoustic guitars, fiddles, banjos and bodhrans. It’s good to see a pub that deserves popularity achieve popularity (see also: the Rutland Arms). It’s good, as well, to sit outside the Red Deer in the garden because it’s such a warm night. And to bump into one of Dan’s mates from his old job, as you do in this most village-like of big cities. Looking at a random pretty girl, I discover, is a task that becomes radically less easy when you’re sneezing nineteen times because of the smoke from hand-rolled cigarettes. By Saturday morning of this week I’m feeling a little peaky. This can’t really be blamed on Friday Lunch Club at the University Arms (where the vegetable lasagne is in very fine nick) and instead seems entirely attributable to Friday night at the Rutland Arms, then the Sheffield Tap (pictured below), then the Rutland again. The reasons for the waywardness of our group of friends this evening are too dull to go in to – oh, alright, and I can’t actually remember them very well not long afterwards – but one thing remains clear. The Rutland (featured here) and the Tap (featured here) are currently engaged in a battle royale to bring some of the greatest India pale ales in the world to the thirsty people of Sheffield and beyond. The Rutland lands a blow with Acorn’s beautifully balanced, bittersweet Simcoe IPA. The Tap counters with Thornbridge Seaforth: rich, complex, butterscotch, and the colour of a shiny new penny. The Rutland is resurgent with Grey Ghost IPA from the Raw Brewing Company: muscular and massive yet somehow nebulous and elusive, and therefore the best-named beer you’ll ever drink. And the Tap rallies with Thornbridge’s lip smacking, thirst quenching, ace tasting, motivating, good buzzing, cool walking, high talking, fast living, ever giving Kipling. Not for the first time, I think back to a time, not so long ago, down in the midlands, when I’d be transported to realms of surprise delight by the mere sight of a pump clip for Courage Directors bitter. And for all that’s grown worse in the world lately, at least the beer is better than ever. ha! yes, i’ve been thinking that last thought myself quite a lot recently, particularly when i end up in, say, the wilmington arms and they’ve *only* got two greene king guests on. 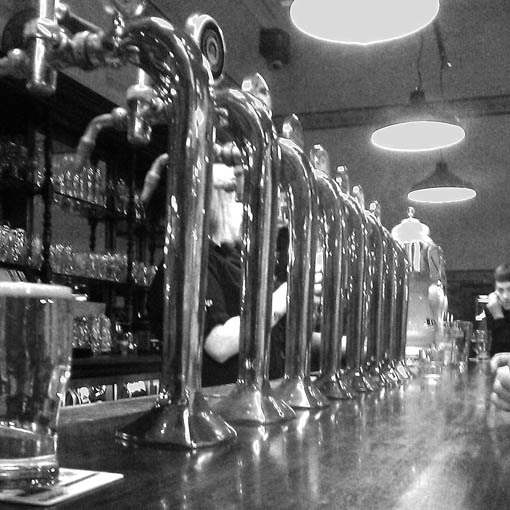 it is pretty marvellous that there are now enough high quality brewpubs/beergeekbars, call them what you will, that I can pretend (certainly in That London, but also from my recent trip to sheffield) that awful beer in crap pubs almost no longer exists!